ball strikers who would benefit from some extra distance and more forgiveness. The innovation in the 919 Hot Metal is exactly that: a hot metal. Chromoly 4140M steel is strong and resilient. It allows new levels of multi-thickness face to create astonishing ball speeds even away from the sweet spot. That dramatically improves the shot performance (distance and trajectory) of less perfect ball strikes. of the toe, that means a more solid feel, and more accurate performance on shots struck wide of the sweet spot. A one-piece cupped geometry and re-engineered sound ribs combine to improve the feel and feedback from these irons. 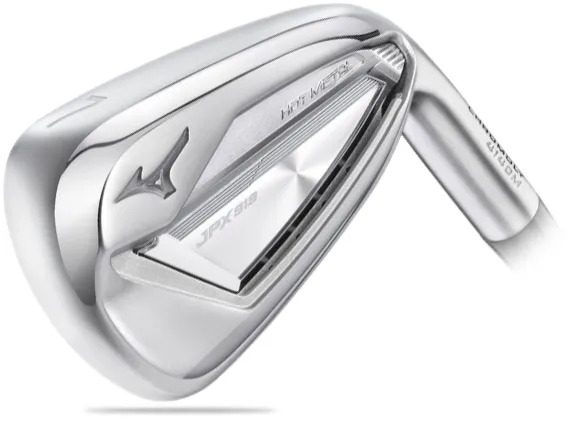 If you’re not a consistent ball striker and/or you’d like added distance to improve your approach shot performance, then you should try the Mizuno 919 Hot Metal. We think, along with the improvements in performance, the step up in appearance and feel will make these really popular with the largest group of our golfers.